I didn't do a favourites post last month as I wanted to try something a little different. Every now and again I want to do a weekly round up of some products and some blog posts I've been loving. I hope you like reading! Real Techniques buffing brush - this is so soft! I'm in love. I have no idea why I let this sit in the box for weeks. It certainly won't be going back in! Perfect for applying mineral foundation, I've used it every day this week. Fresh Sugar lip treatment - The lovely Laura from A Scottish Lass sent me this as she'd had a Birchbox mixup and had several. This is a divine lip balm from the States that I'm making myself ration as I know how hard it is to find in the UK. The new growth mascara from GOSH - I've been using this since the event on Wednesday and really like it. I've yet to see any changes in my lashes but I'll be giving a full review in a few weeks. 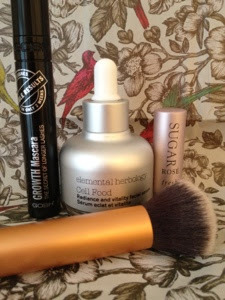 Elemental Herbology cell food serum - My skin seems to adore this serum. It absorbs so quickly and gives a radiant look after just a few uses. There'll be a full review coming up on this soon. Pampered Prince started his new A-Z skincare series with the 'A's - I'm eagerly awaiting the next installment already. Kate (Gh0st Parties) wrote a tongue in cheek post about blogging which made me laugh out loud. What have been your favourite things this week? I like the GOSH mascara too and I'm curious about the results. me too - fingers crossed it's good! Great little post - I love reading these posts and I'm dying to start doing them myself. I love the Cell Food serum, my skin adores this too!